Tumi Men’s International Dual Access is a special design premium carry-on suitcase with eight wheels and a 44-liter capacity as part of the Tumi Alpha 3 Collection. 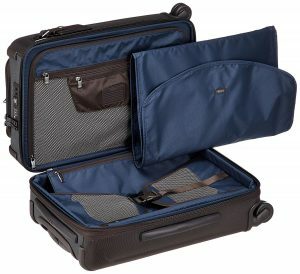 It is a very expensive piece of luggage with a very innovative design and that is made of Tumi’s patented ultra sturdy and durable FXT ballistic nylon. It can be purchased in anthracite or black colors, both of which at the same price tag. The Navy Restoration Alpha 2 with a 30L capacity, that is roughly 275 dollars cheaper is also offered on the same page. Ballistic weave Tumi Men’s Cabin Bag weighs 9.7 pounds and measures 22 x 14 x 9 inches without the wheels and the handles and 23 x 15 x 11.5 inches with them. It meets the carry-on luggage size restrictions for traveling in Asia and Europe. 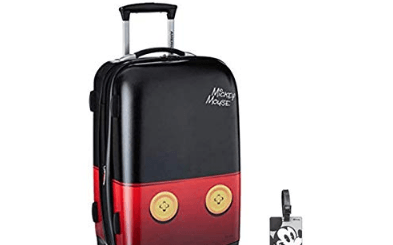 You have two different entries to the main section with the innovative design of this carry-on luggage. You can get quick access to your clothes and other items through its U-shaped front lid. There is a convenient integrated USB port to charge your smartphone or tablet or to connect your electronics on the go.Please note that the power bank is not included and you need to purchase it separately. You can fit a suit in this one easily as it comes with a separate garment sleeve to keep a suit free of wrinkles and in shape. The suit bag and the hanger are included in this high-end model. There is a hanger spot inside this cabin luggage that you can snap in. You’ll also find the straps on the inside cover to secure the suit. When you shut the Tumi your suit will be folded once. The zippers on this cabin bag is heavy duty and glide very smoothly. The bag is lightweight despite being super durable, lets you fit quite a bit inside (spacious interior), and offers a variety of user-friendly features. But being a high cost luggage the expectations are quite high by customers. The average customer rating is lower than it should be because of very specific customer complaints, like someone breaking the zipper and Tumi asking them to pay for sending the bag to a repair center in another state. Someone pointed out their inability to get the wheels to go straight without making corrections by hand. And Tumi changed the wheels for the first time and the whole bag the second time. Tumi Alpha 3 Men’s Carry-on has the built-in combination lock that is TSA compatible for only the TSA staff to open your luggage without breaking it, for security check. Tumi Alpha 3 is an ideal carry-on bag for the frequent business traveler that wants a premium bag that will last them for many years. It is an extremely well constructed bag that will not break easily even if abused frequently by airline staff. You can expand this Tumi by about an inch, but being already a large carry-on it may not fit the overhead bin above you as expanded. You can expect only the best from this expensive piece of luggage with an innovative design, premium look and feel, versatility, functionality and better performance. If you wish to personalize your bag, you may want to contact Tumi directly on the phone number at 1-800-299-8864 to locate the Tumi store closest to you. Or you can find it online and go directly to your local Tumi store. 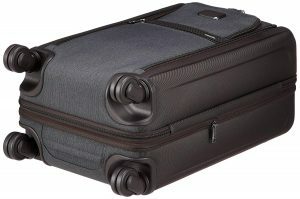 Full Tumi warranty starts from the day the customer purchases the luggage from Amazon or iServe. Overall the Tumi Alpha 3 Men’s International Dual Access is a great value rock solid bag for those that travel frequently for business and have the budget for this type of bag.